As a graphic designer in Orange County California, I work with lot of different clients in a lot of different industries. I deal with stock art, photos and text all day long and I see this same issue again and again. Clients don’t really know what’s okay to use and what isn’t. Now, I’m not an attorney. I’m friends with many and related to a few, so bear with me here as I share some very very basic information on copyright. As Americans living in the United States, we have copyright built into our legal system as a form of what is termed ‘Intellectual Property’. Let’s break this term down really quickly. Intellectual refers to the mind and creations that come from it. Property is something owned by a person. Putting the words together means that this type of law covers the ownership of work created by the mind. Pretty much anything that a person can create on their own as a unique and brand new piece of work can be protected by copyright. These things are usually things another person can experience with their senses. For example, artwork. Any type of artwork or photos can be covered by this, also text such as poetry or novels or scripts can be covered. Even music and song lyrics can be covered by copyright. If you’re looking for a full list of what specifically can and can not be covered by copyright, head over to Copyright.gov. They have a full list on their website. What happens if I use something that is copyrighted? In the USA, a copyright automatically exists the moment a person creates an original work including art, writing, music, photographs. It belongs to the person who created it. Even if the work is not registered with the government’s Copyright Office, the person who created the work owns it and can defend it in court from those who copy the work. Registered work is easier to defend in court. If you use a copyrighted piece without the owner’s consent, you open yourself and your business up to a chance of being sued and taken to court by the copyright holder. Depending on the outcome of each particular case, you might end up paying a large fine, have to stop using the work, and may have to surrender all profits to the copyright holder. Personally, I don’t think taking the chance is worth the penalty. This is a term a lot of people have heard, but don’t fully understand. Public Domain is a legal term that refers to any work whose copyright are no longer valid. The rights could have expired. They can also be waived or forfeited by the copyright holder. In some cases, the works is not eligible for copyright protection. Can I use artwork or photos that are public domain? Yes! Works in the public domain are allowed to be used by the general public for any purpose including for commercial business use. As the user of the piece you are not required to cite the creator of the piece & can freely use it. Although, if you know who created the piece or where it came from it is always nice to attribute your source. Creative Commons is actually an organization that helps people more easily navigate what is and what is not copyright protected on the internet. Using work that is part of the Creative Commons network is pretty easy. They have many choices for users to select. Some of their licenses are free and others are not. Different licensing options restrict different groups and types of use. You may need to attribute or give credit to the original author in order to use the work. I recommend reading their website for full explanations of their license options. Is Creative Commons license 0 or CC0 okay to use? Is it the same as public domain? Yes, CC0 license is okay to use as long as you follow the license instructions! Please always read them to save yourself from surprises later on. The CC0 license is not exactly the same as Public Domain. Public Domain is a category of use. Works here are open for the public. CC0 is a type of copyright license. What the CC0 license does is help content owners who wish to waive their copyright and donate their works to the public domain do so more easily. For more detailed information on CC0 & how it works, I recommend heading over to the Creative Commons website & reading their article on CC0 licenses. 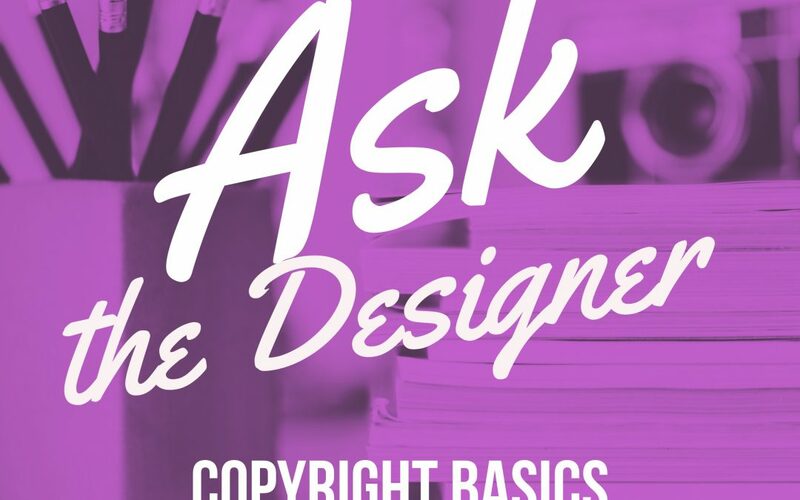 Hopefully you found this a helpful place to start in your understanding of copyright! Copyright is incredibly complicated and nuanced. This just touches the tip of the iceberg. My parting wisdom on the subject is to please always read the license of anything you find online or anywhere else that you are interested in using. Ask people where the piece you like appears if it is their piece and how you can get permission to use it. It never hurts to ask. Lastly, If you don’t know if something is copyrighted, please choose caution and either ask an attorney (preferably one who is experienced with copyright and intellectual property law) or simply don’t use it. If you ever need a little help designing your next project complete with public domain photos or artwork, please contact me!